When you're traveling you get used to looking outside your window and not recognizing anything. On buses and boats, in taxis and trains, the life of the world passes by your window in a blur of colors and energy. Sometimes it's hard not to let it all run together. Sometimes the landscape, the buildings, and the people are similar enough to the last country you were in that you can forget you're in a new place. If you're not concentrating, the chants coming from the Thai temple in Bangkok can sound like the call to prayer coming from the Turkish mosque in Istanbul. When you're drifting down a river on a rickety boat, the local life along the shore of the Mekong in Southeast Asia can look like the local life along the shore of the Amazon in South America. When you're walking around town, the traditional music being played by the school children of Kampot, Cambodia can echo off the buildings like the church bells ringing in the main square of Salta, Argentina. And when you're exploring, the step you take in the ruins of Angkor Wat can feel like the step you took in the ruins of Machu Picchu. But every country has its own flavor. Every country, when I think of it, has snapshots in my mind that encompass everything that country means to me. When I look back at those moments, I suppose you could say they are the first snapshots I have in my mind of each country. It was the height of the day, the television on the bus was blaring a movie, the guy behind us was snoring loudly, and we were in the middle of nowhere. Specifically we were at 16,500 feet in the middle of nowhere. 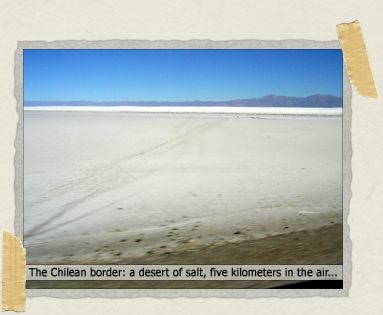 As the bus rolled along, we looked out onto the salt flats that surrounded us. Twenty minutes earlier we had been in a small building getting our stamp out of Argentina. And now we were traveling to, one would have to guess, another small building where we would get our stamp to enter Chile. But in-between, there was nothing. Another hour or so passed. We alternated our view between the vast expanse of white desert surrounding the bus, and the action movie on the television. And then, out of nowhere, another little building appeared. Lurching to a stop, we were instructed to gather our things and exit the bus. At the bottom of the stairs, a Chilean immigration officer instructed each of us to step from the bus directly onto a giant sponge. The girl in line before us missed the sponge and stepped onto Chilean soil first, prompting a swift reprimand from the officer who pointed again at the sponge. Correcting her misstep, the girl hopped on to the sponge and waited until the officer said she could enter the small building, the immigration entry point for Chile. There's always that moment, when you're crossing the border, that moment when you've walked up to the immigration officer's desk or window. It's a moment that in reality lasts maybe one or two minutes, but it will be one of the longest minutes you'll ever live. He'll hold your passport, read the first page, type in some things on his computer or handwrite your information on a tattered piece of paper. He'll look at your passport some more, flip through the pages, glance at you, and mumble a few things in his native language to another officer. Slowly (it always feels slowly) he'll move his hand to pick-up the stamp he needs and finally he'll stamp and sign your passport. Then, before you realize what's happening, he'll push your passport back in your hand and request the next person in line to step forward. And that's it, you've crossed the border. With our Chilean entry stamps fresh in our passports, Tim and I stepped back onto the bus. The sponge, we had determined, was meant to wash off any Argentinean soil that had been on our shoes before stepping into Chile. So thirty minutes after washing our shoes, everyone was approved for legal entry into Chile and we continued on our way. A few minutes later, still in the middle of nowhere and surrounded by a white desert, Tim whispered in my ear, "Welcome to Chile." We had left Tim's aunt's house in London close to midnight in order to grab the last train to the airport. The tube was deserted at that time of night, at least on the line we were on. Arriving at the airport close to one o'clock in the morning, we barely remembered that we had never taken an obligatory picture of a London Underground sign. And so with the picture finally out of the way, we found our way inside the airport. There were few other passengers waiting for flights at that time of night. The people who were there were already fast asleep, having arranged themselves rather awkwardly on the floor or on long rows of chairs. After locating where we'd need to check-in for our flight in just a few hours, we settled in to catch a few hours sleep on some fairly comfortable (at least by airport standards) seats before our flight to Istanbul, Turkey. We knew our flight from London to Istanbul was severely overbooked, so getting in line early was important to us. Given we had arrived at 1am and the check-in for our flight wasn't due to begin until 6am, we assumed we would be some of the first people in line to check-in. After all, there were only a handful of people in the entire airport when we finally drifted off to sleep. So it was rather ironic when we woke up at 4:30am and discovered a giant line had already formed. In the end, we would be some of the last people to check-in, but we did get on the flight. With a very brief stop in Milan, Italy (and by brief I mean off one plane and immediately on to the next with no wait in-between), we arrived at the Istanbul airport close to noon. And about an hour later we were in the heart of Istanbul, standing with our packs on our backs between the Aya Sofia and the Blue Mosque. Looking for lodging that afternoon would be a bit more trying than most days, but we finally found a nice place and settled in. 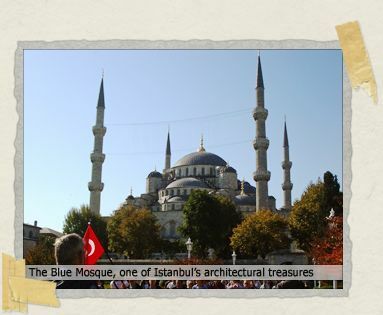 Later that evening with the sun setting over the Sea of Marmara, the call to prayer began to come from the mosque which would later become known to us as "our mosque." Standing on our balcony while listening to the gorgeous notes echo off the streets of Istanbul, Tim whispered in my ear, "Welcome to Turkey." "You must hurry! Come, come! Let's go, now! Now! Go! Go!" 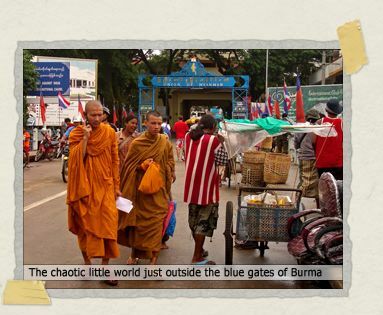 From the beginning of our trip, Tim and I had always planned on traveling to Burma. Whether or not to travel to Burma is somewhat of a controversy amongst travelers, and rightly so. But after a lot of research and even more thinking, we had decided that going to Burma felt right to us. And so sometime between visiting Thailand and Malaysia, we had planned to do just that. What we had not planned on, however, was doing what we were doing right at that moment: a border run. Uncharacteristically of us, Tim and I had painted ourselves into the corner of needing to do a border run. 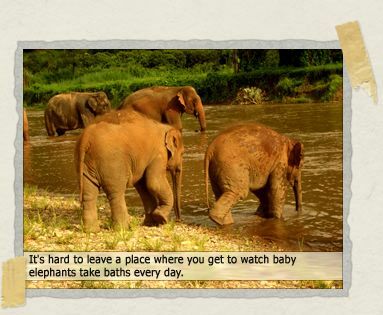 We had fallen so madly in love with Elephant Nature Park that we didn't want to leave Thailand anytime soon. But if we stayed at the park, we were going to go over our Thai visas. And to the tune of $25 a day for the both of us, that was something we definitely couldn't afford to do. And so the day of our border run arrived, and off we went to see some of the (mind numbingly boring) sites in the area known as the Golden Triangle (where the borders of Thailand, Laos, and Burma meet). After about 6 hours of travel (including the oh-so-stereotypical lunch in a jewel shop where we were encouraged to "Buy! Buy! "), we had finally arrived at the border with Burma. The rest of the tour group (who were actually people paying for and interested in doing this tour – why exactly, I am at a loss to say) were scheduled to do some shopping in the Thai border town. Tim and I were the only ones who needed to cross the border into Burma for a border run. A border run is a simple process and one that we didn't need any help with. So after the tour guide told everyone to meet back at the tour bus in 30 minutes, we assumed we would be going across the border on our own. We were wrong. And so that is how we ended up with the Thai lady yelling at us. She was our tour guide for the day, and a rather racist (towards Burmese) tour guide at that (a story for another time). Unbeknownst to our friends who had arranged the tour for us, we had been pawned off on to another tour company. One whose employees were, quite honestly, shocking. And so when she urged us to walk faster, that is why we simply did not. Having received our exit stamps from Thailand, with her racing ahead to lead the way, we walked across the bridge to the Burmese immigration office. Aside from the tour guide, it was a rather bittersweet moment for us. Because we were making the choice to stay longer at Elephant Nature Park, we knew we wouldn't be able to return to Burma to travel in it properly. We just wouldn't have enough time, and so Burma had to be cut. This quick two minute visa run would be our only time in Burma. At the border, of course, everything looked the same as it did in Thailand. But we knew beyond the border there was a completely different world: a world that, for us, would have to wait for another day. After just a few minutes in the Burmese immigration office and on Burmese soil, we turned and walked back across the bridge toward Thailand. The tour guide, yelling at us the entire way, was several feet ahead of us. Monks passed to our right, the river was on our left, and Thailand lay before us. But before leaving Burma, amidst all the chaos, Tim whispered in my ear, "Welcome to Burma." The decision to go to our current destination wasn't an easy one. There were arguments for and against it. We could have chosen another destination, but a lot of things were pulling us to this particular one. Regardless, it took us well more than a year of travel before we could make the decision to go. And it took us several more months after that decision was made to be ok with it. Before boarding our flight, an announcement came over the loud speaker, first in Korean, then again in English, warning passengers of increased security measures at our destination. My heart leapt and I started feeling nervous about where we were going. Maybe we were making a mistake? Maybe we shouldn't go? Maybe we should just go someplace else? As our plane started to board, I realized I was being silly. I reminded myself how many times I had felt nervous before going to a new country. And I remembered all of the reasons why I wanted to go where we were about to go. Several hours later our plane landed in the new country. I looked out the window and, as always, didn't recognize a thing. But I wondered what memories from our trip this new place would remind me of. And I wondered, in a few months time, what snapshots of this new country would be in my mind. While we taxied along the runway, the people around us started shifting in their seats nervously, gathering their belongings, and getting ready to stretch their legs. I continued to look out the window, trying to remember the moment. …Unless of course, home is a place far away that you visited and decided to live forever Well either way, enjoy the slow pace of settling in! You owe us a visit. What a beautifully written entry and a beautiful ending to a fantastic trip. I have so enjoyed following your adventures and wondering what you would discover next. I have been awed by your experiences and the way that you have opened yourselves up to the people and places you have visited. I too am curious what snapshots of this new country will be in your mind – because most likely you will see home in an entirely new way now. OMG! You caught me so off guard. Welcome home! I am sure it feels like you are in a strange, odd country right now. Take your time re-acclimating! I hope there's still more updates and pictures to share… I think the rest of *US* missed a few days of *YOURS* somewhere in there. I'm sure it won't be long before your next trip is in the works. Take care. I had a feeling that this might be happening soon. Welcome home, guys! Now where the heck are you? 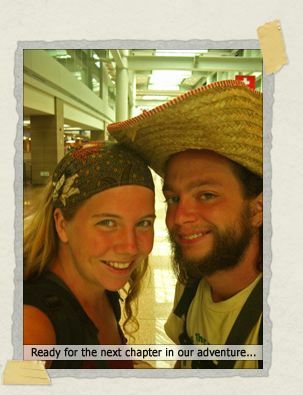 welcome home guys . . . . your adventures and stories are so inspiring! Welcome back! Looking forward to hearing all of the stories you didn't have a chance to tell yet! Hopefully sharing your travels with us will help with that weird post-trip feeling! Welcome back. Your entry was wonderful. I look forward to hearing about your transformed life in this new place. I have missed reading your updates over the past month and will be anxious to catch up. why didnt you say anything further?!?!?! Jump for joy! Jump for Joy! welcome back. 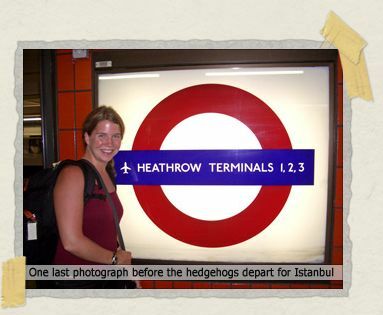 i missed you, but i didn't miss you because i got to read all about the hedgehogs abroad. Congratulations on your safe return home. I have enjoyed following your trip since sometime in Argentina. You both have a knack for writing that really will be going to waste if you do not pursue it at some level. You should consider doing some work as travel writers. Get paid to travel! And the photos were phenomenal! Speaking as someone who has wandered the globe for a year at a time, I know that you must now be feeling a whole range of thoughts and emotions that no one you have come home to will fully understand and that you yourself will probably not be able to convey. You are fortunate in that you have each other to share these thoughts and feelings with. Hopefully years from now you will find yourself saying, "Remember that night on the plaza in Salta…?" and only the two of you will really know how it was. Again, congratulations and thank you for allowing all of us to follow along for the past 18 months. You're like celebrities. If I saw you on the street I'd ask you for your autograph. It's been such an inspriration reading about your adventures. The words and photos conveyed your emotions and wonderment with such clarity. I look forward to hearing more. Welcome home hedgehogs! How come you didn't tell Philsie you are back? Great job, guys. You've presented us with all the best this tiny planet has to offer, and it's been a pleasure. In fact, your decision to embrace the world so fully has only encouraged us to do the same.